In its third year, the June 2018, Greater Kansas City Metro Antique Postcard and Paper Show returns to Lenexa, bringing collectors, vendors and hundreds of thousands of antique postcards and vintage photos to the KC Metro area, June 22-23. 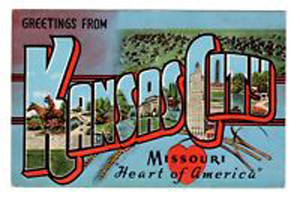 CourthouseSquare.net and Jim Taylor present the Greater Kansas City Metro Postcard and Paper Show, June 22-23, at the Clarion Hotel Kansas City - Overland Park (Lenexa), 12601 West 95th St, Lenexa, KS, 66215. The Clarion Hotel Kansas City - Overland Park, Lenexa is conveniently located at the 95th Street exit off Interstate 35. The show is once again scheduled in the hotel ballroom, opening Friday June 22, 11am to 6pm, with an ‘Early Bird’ at 10am. Saturday, June 23, hours are 9am - 4pm. Admission is $4 for both days, or $6 ‘Early Bird’ admission, also good for both days.